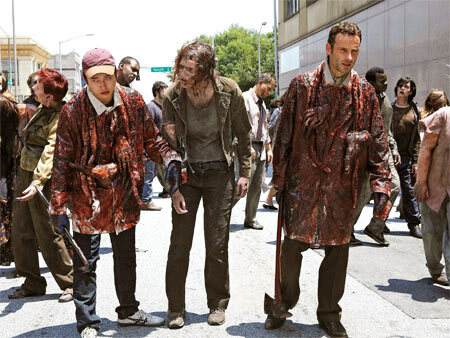 Actors Steven Yeun (from left, "Glenn") and Andrew Lincoln ("Rick Grimes") struggle to survive an undead apocalypse in AMC's The Walking Dead. The author wishes to thank Mark Heimermann and Michael Lang for introducing him to the series. Associate professor of comparative literature at the University of Wisconsin-Milwaukee and author of From Utopia to Apocalypse: Science Fiction and the Politics of Catastrophe (Minnesota 2010). In recent years, zombies have been fruitful and have multiplied across the landscape of American popular culture. Ever since the films 28 Days Later and Resident Evil revived the genre almost a decade ago, cannibalistic ghouls have gone on to thrive and proliferate in a host of popular films, television shows, comics, and novels. The decomposing undead have come a long way from George Romero’s spare and terrifying classic of 1968, Night of the Living Dead. A modest, low-budget production shot in black-and-white in which chocolate syrup was used for blood and donated pork roast for human flesh, the terror and alarm evoked by grotesque images of the undead slaughtering and feeding on the living were greatly amplified by the film’s grainy, compellingly realistic look. Though Romero’s film went on to achieve box-office success and garner favorable reviews from prominent critics like Pauline Kael and Roger Ebert, the genre that it spawned was generally held in low regard for catering to crude appetites for carnage and gore. But the pilot episode of the latest manifestation of the contemporary zombie craze, the AMC series The Walking Dead (based on the comic written by Robert Kirkman and drawn by Charlie Adlard and Cliff Rathburn), drew an audience of more than 5 million—the largest number of viewers for any show thus far on that cable channel (including the trendy Mad Men). It could be argued that animated, flesh-eating corpses have become a more solid fixture in the cultural mainstream than Don Draper’s hat. But what do zombies signify, and what does widespread fascination with the living dead tell us about our historical present? Raina Kelley argues in Newsweek (see link below) that the popularity of zombie narratives corresponds to heightened states of fear in American society: Romero’s pioneering film evokes the dread of nuclear conflict between the superpowers and the horrors of the war in Vietnam, while films and novels of the post-9-11 era play upon our fears of contagion in an interconnected world, whether in the form of viral infections or terrorist networks. Sarah Juliet Lauro and Karen Embry, authors of “A Zombie Manifesto,” (see link below) observe that the void and vacant consciousness of the zombie, coupled with its unappeasable hunger for the flesh of the living, enables it to embody the divergent figures of the enslaved worker and the insatiable consumer. The cannibalistic undead can thus be invoked to critique both depersonalizing collectives as well as predatory individualism. 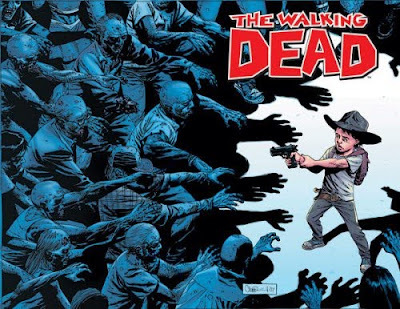 In The Walking Dead, the comic upon which the AMC series is based, it is not an overbearing and intrusive central authority that is the object of fear and dread for the characters. Rather, governmental institutions are at the outset objects of a desperate and chimerical hope. As in numerous other zombie narratives, a plague of zombies has overwhelmed civilization, bringing about the collapse of the economy and the state. Survivors must contend with the fate of being perpetually exposed to life-threatening dangers. They are forced to rely on their wits, resolve, fortitude, and, most crucially, their capacity for cooperation to preserve their lives as well as those of their loved ones. 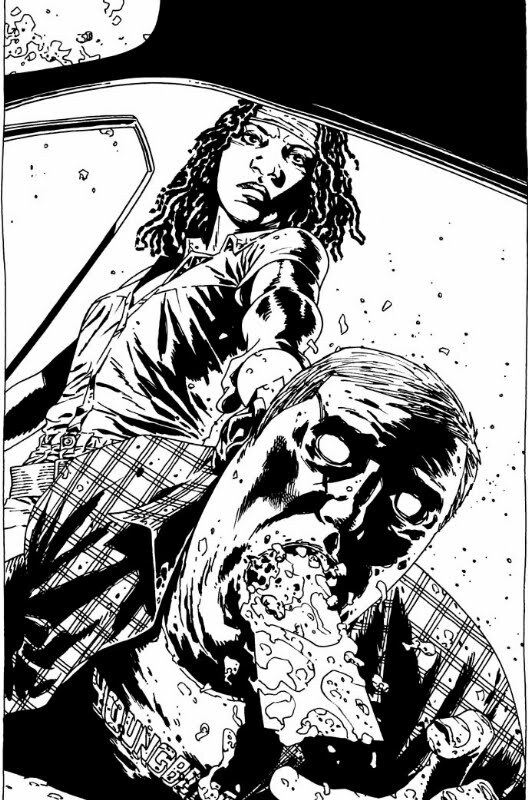 The protagonist of the series is police officer Rick Grimes, who for much of the narrative serves as the leader of a group of survivors that include his wife, Lori; his son, Carl; former pro football player Tyreese; sharpshooter Andrea; retiree Dale; ex-pizza delivery boy and car thief Glenn; and Michonne, a lawyer in her former life who wields a katana with deadly effect against the undead and other humans who threaten the group. The narrative follows this band as they wander in search of food and refuge from the undead, migrating from a campground to a gated community, followed by a farm, and then a federal penitentiary. They lose some members and welcome newcomers along the way. They also learn, in the most agonizing ways imaginable, that other organized groups of survivors are far more deadly than the zombies themselves. The Walking Dead achieves a wrenching intensity in depicting the deaths of its characters as well as in examining the guilt that afflicts those who outlive their loved ones. An attack on Rick’s family and friends by a nearby community under the thumb of a psychopathic warlord takes the lives of the most sympathetic and many-layered characters in the series. Writer Kirkman pulls no punches in his depiction of this confused assault, which turns out to be no less devastating for being disorderly and poorly executed. The harsh realism with which he depicts the battle does not spare the most innocent and the most vulnerable. Other characters die from losing heart at the loss of their loved ones or find themselves unwilling and incapable of coping with a new and dangerous world. Children, on the other hand, adjust too readily for their parents’ taste to the daily reality of death and violence. Rick's young son Carl’s mental state becomes a source of constant concern as the boy seeks to emulate his father by doing the harsh and necessary things that everyone else balks at doing. It is noteworthy that such an unrelievedly grim narrative has achieved mainstream commercial success in a culture that remains in thrall to the relentlessly optimistic image it holds of itself. What could account for the appeal and popularity of such an unremittingly downbeat narrative? Has The Walking Dead captured something vital about the zeitgeist that might elude more respectable and ostensibly more serious literary works, such as Freedom or even The Road? Post-apocalyptic fiction is a familiar and well-established genre, to be sure, but The Walking Dead arrives with a heightened sense of urgency missing from earlier narratives set in post-apocalyptic worlds. Like most post-apocalyptic works, the comic portrays characters searching for food and staving off the dangers endemic to a hostile environment, but the pervasive gloom and uncertainty that has overtaken American society since the collapse of the housing bubble in 2006 endows the comic with an unusually sharp emotional resonance. The Walking Dead invites the reader to engage in an extended thought experiment in which ordinary people are forced to give up lives of affluence and security to endure grueling hardships and cope with life-threatening dangers. Indeed, the back cover of collected editions of the comic asks its readers to consider how they would live were they deprived of the conveniences and freed from the distractions of modern consumer society, and thus to reflect on what kind of people they would become when confronted by harsh and brutal necessities. The inertia that grips the political and economic status quo has left many Americans with the foreboding that they will inhabit a substantially different country in years to come. The times of easy abundance and prosperity might well dim into a painful daydream for many of those unfortunate enough to remember an affluent past. Yet at the same time, could we not say that more than few individuals resent how consumer society infantilizes them, and renders them addicted to trivial distractions? Are they not also made uneasy at never having been compelled to develop courage, resourcefulness, and fortitude, qualities that have been revered and deemed necessary in practically every other historical period? 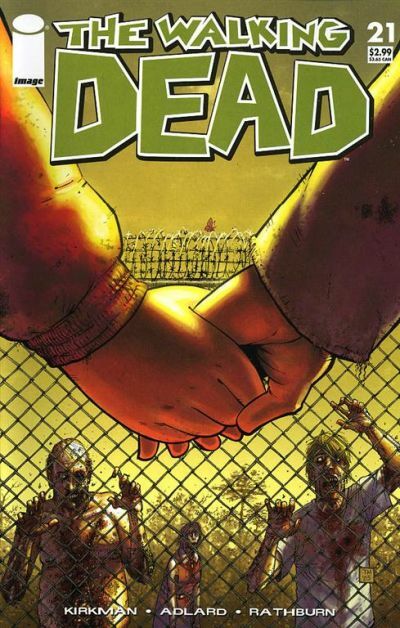 Kirkman’s comic achieves a surprising poignancy and emotional force by means of its convincing portrayal of brutal dilemmas and no-win situations. It emerges as a far more complex and layered text than the arguably most celebrated “serious” literary work of post-apocalyptic fiction of recent years, Cormac McCarthy’s The Road, in which a fixation with lyrical descriptions chokes off the unfolding of any vital ethical dilemmas. Rick and his group take up residence in a penitentiary, where fences and gates keep them safe from the undead, but soon find themselves under attack by a numerically superior force from a nearby town with the objective of taking over the facility for their own people. Should they abandon the complex they have toiled so arduously to turn into a sustainable refuge, with crops, running water, occasional electricity, and storerooms stocked with canned food, or should they stand their ground and fight against the odds? Rick’s decision to defend their home results in catastrophic losses, and survivors of the raid are forced to abandon the penitentiary, which is rendered useless by the battle. Yet Rick’s choice, as terrible as its consequences are, comes across at the time as reasonable and pragmatic, borne out by the fact that most of the attackers do not know how to fire their weapons properly and possess limited quantities of ammunition. Similarly, Rick objects to a risky mission undertaken by Michonne and Tyreese to sneak behind enemy lines and thin out the ranks of their foes. The fact that they come within a hair’s breadth of success, almost cutting off the head of the beast, underscores the tragically narrow margin between total victory and utter calamity, the best of all outcomes and the fulfillment of the most terrible of nightmares. Would the group have been able to fight off its attackers had Michonne and Tyreese stayed behind with them, or would the result also have been failure by virtue of facing an enemy who was simply too deranged to be deterred? The narrative remains tantalizingly reticent on this question. Yet, as is often the case in post-apocalyptic fiction, the shared sorrows the characters endure serve as the cornerstones of the community that they rebuild. Rick’s group is a racially mixed one that contains wide range of personality types, including (at various points) ex-cons, an unbalanced teenager, a judgmental church lady, a stoic veterinarian who experiences Job-like losses, an intimidating Army sergeant, a guilt-wracked minister, and a shifty scientist who sports a mullet. They take their places alongside several key individuals who cultivate talents they never suspected they possessed—such as Andrea, who becomes an expert sharpshooter. Like the film 28 Days Later, Kirkman’s comic provides a compelling meditation on the origins of human societies. But whereas the film highlights the brutality and coercion employed by warrior tribes to propagate their biological line, The Walking Dead depicts the stresses, frictions, and also reconciliations involved in building a common life among diverse individuals who have been thrown together by circumstance and forced to cope with living, in the words of US diplomat George Kennan, in a “crowded and inescapable political community.” This is a predicament to which Americans have been able to remain largely oblivious, thanks to the geographic and economic expansion that presently seems to have run its course. It is the question of who survives and who dies that leads to the thorniest aspects of the current zombie craze. There will be those who make the case for the progressive political value of a narrative like The Walking Dead, since it depicts a set of conditions in which virtues forgotten and neglected by high-tech capitalist society take on paramount importance in the struggle for existence, such as resourcefulness, cooperativeness, and selfless dedication to others. In such a context, greed leads either to derangement or immediate death, or to the pathetic and pointless subsistence of human vultures steadily being eaten away by the awareness of their contemptible submission to biological imperative. Though the building of community and the creation of comradeship are at the forefront of Kirkman’s comic, The Walking Dead also shows the undoing of those characters who cling too much to the attachments, frivolities, and habits of the bygone world. Allen, who had always looked to his wife for guidance, loses the will to live after she is killed in a zombie attack, although he has two young sons to look after. Former housewife Carol cannot overcome her sense of neediness, which, given her looks, she could satisfy rather easily in an affluent consumer society. She interprets the constant preoccupation of the others with practical tasks as an implicit judgment against her weaknesses. She cannot get over the shame over having been rejected by Rick’s wife Lori when she proposes that she “marry” them to become Rick’s second wife, so she gives up her life to the zombies, because they at least “want” her. In a collective existence in which one is obliged to be resourceful and courageous in confronting horror and danger, there is not enough pity to go around for those who cannot or will not struggle against their weaknesses for the sake of the survival and well-being of the group. A terrible and merciless simplicity comes to rule over the lives of the survivors. Rick tells Abraham, after fighting off a group of marauders literally by tooth and nail, of the “switch” that goes off in some people, which enables them to adjust to brutal and dangerous conditions. These people are able to do “whatever it takes to survive and to help those around [them] to survive.” Those who are too immersed in their material comforts, take for granted their security, and cannot imagine a severe and drastic change in circumstances, are by contrast far more likely to break down and become zombies. As the class divide widens in American society, it is difficult to avoid mapping the divide between "haves" and "have-nots" onto the one separating the living from the undead. A society that is forced reorganize and reimagine itself without ever-increasing wealth and abundance as its ultimate horizon, even if it is fortunate enough to accomplish this task without making a detour through the state of nature, is likely to experience the exacerbation of divisions based on the boundaries that are made tolerable by abundance and prosperity. Indeed, the capacity to confront social upheaval calls up historical scenarios in which paramilitary groups rule over a collapsed society. Furthermore, as the late novels of J. G. Ballard reveal, the “switch” is perfectly compatible with the wealth and privileges of neoliberal capitalism. Ballard’s late novels have as central characters a series of clinically dispassionate messiahs who preach the religion of the “switch,” in which inflicting — and submitting to — therapeutic violence becomes the means of rejuvenating a life sterilized by security and affluence and of opening the passage to a more intense and sacred form of existence. In the latest storyline of The Walking Dead, Rick and his friends settle into a protected community set up by a government agency to provide shelter in the event of some collective disaster. Perhaps this turn in the narrative will provide the chance for an extended reflection on social divisions in the consistently challenging manner Kirkman’s comic has worked out the problems of life in times of upheaval. -Raina Kelley, "What We Mean When We Talk About Zombies," Newsweek (October 27, 2010). -Robert Kirkman, Charlie Adlard, and Tony Moore, The Walking Dead. Berkeley, CA: Image Comics, 2003-present. -George Kennan, Memoirs 1950-1963 (New York: Pantheon, 1972). -Sarah Juliet Lauro and Karen Embree, [PDF] "A Zombie Manifesto: The Nonhuman Condition in the Era of Advanced Capitalism," boundary 2 35:1 (2008). As a long-time resident of Atlanta (where the show is set) I think it's hilarious that human life is staged in the suburbs (it seems to be either Newt Gingrich's Cobb County or Douglas County, judging by sky line shots). Constantly the humans risk their lives by driving into the city and interacting with the nonhumans. They excuse this breach of fraternization taboos with the husk of free market capitalism, no longer restrained by notions of exchange. The goods the suburban humans want exist exclusive for their taking. This is precisely the relationship the rest of the state of Georgia has to Atlanta (a significantly Balkanized city).